Thunderstruck II is a 5-reel, 243-pay line online slot from Microgaming. Thunderstruck II is the sequel to Microgaming’s original 2004 release which had proven to be one of the most popular online slots of all time. The sequel, which was released in May 2010, turned out to become even more popular than the original, and many Microgaming fans hold the opinion that Thunderstruck II is the best game that the gambling software company has ever released. Visit www.Guts.com to play Thunderstruck II now! Whereas the original Thunderstruck game concentrated on the hammer-wielding Norse god Thor (and before he received his entry into the Marvel series of superhero movies), Thunderstruck II expands to include several more gods from Norse mythology. Thor still makes an appearance of course, but he is joined on the reels by his half-brother Loki, the ‘chooser of the slain’ Valkyrie and the daddy to all these weather-obsessed gods, Odin. All these characters are joined in the ‘great hall of spins’ by some other viking-inspired symbols, plus the playing card values nine through to ace. This game has 243 pay lines which means that to win a pay out, you simply need to land a sequence of identical symbols across the reels – which actual reel any symbol lands on does not matter as long as they follow on, one after the other across the reels. You need to land at three identical symbols in sequence. You can choose your coin size for this game from 0.01 to 0.05, and the number of coins you want to risk for each spin between one and ten. Your final wager is your coin size multiplied by the number of coins multiplied by thirty. Your minimum wager is therefore 0.30, and your maximum 15.00. When you are happy with your bet, hit the ‘spin’ button. Payouts start at 5x your bet-per-line for three nines or tens, up to 1,000x your wager for five ‘Thunderstruck II’ logos. Wild Symbol: The ‘Thunderstruck II’ logo acts as the wild symbol and substitutes for all other symbols aside from the scatter symbol. All wins containing a wild symbol are doubled. Wildstorm Feature: The Wildstorm feature can strike at any time, and will randomly turn between one and five of the reels completely wild. Any wins you are due are then recalculated. Great Hall of Spins Feature: You get to enter the Great Hall of Spins feature if you land three, four or five bonus symbols anywhere on the reels. This unlocks one of the bonus features listed below, depending upon how many times you have entered the Great Hall of Spins previously. Valkyrie Feature: Awarded the first four times you enter the Great Hall of Spins. You receive ten free spins in which all wins are subject to a multiplier of 5x. Free spins can be re-triggered. Loki Feature: First awarded when you enter the Great Hall of Spins for the fifth time. You receive fifteen free spins with the ‘Wild Magic’ symbol on reel three. This wild symbol randomly transforms symbols into additional wilds when it lands. Odin Feature: First awarded when you enter the Great Hall of Spins for the tenth time. You receive twenty free spins with the ‘Wild Raven’ feature. Odin’s Ravens will randomly turn symbols into 2x and 3x multipliers. Thor Feature: First awarded when you enter the Great Hall of Spins for the fifteenth time. You receive twenty-five free spins with the ‘Rolling Reels’ feature. Consecutive wins will increase the prize multiplier from 2x up to the maximum multiplier of 5x. The original Thunderstruck game gained a lot of fans from its initial release in 2004, and there was much anticipation when Microgaming announced their intention to release a sequel. 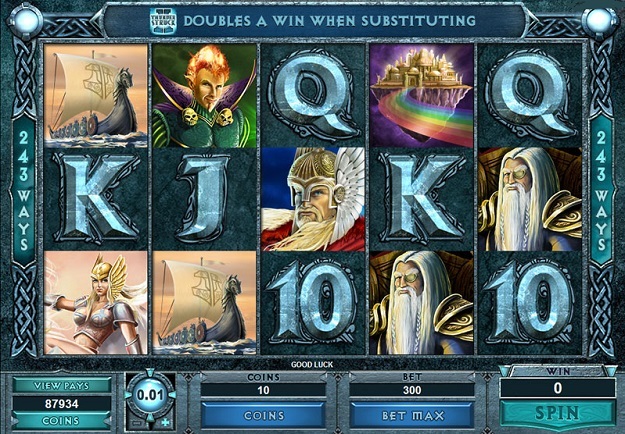 In the event, Microgaming really delivered with another classic Norse-themed slot that surpassed even the excellence of the original Thunderstruck game. The Great Hall of Spins feature is a really great addition, as you are rewarded with higher bonus chances the more prolonged your playing session becomes, and there’s an amazing maximum jackpot of 2.4 million coins that can be won. All-in-all a truly great online slots game that deserves its wonderful reputation.